Seahawks mailbag: Getting creative with Russell Wilson’s contract? Asking price for Frank Clark? Let’s keep it short and sweet — it’s time for another edition of the Seahawks Twitter/email mailbag with questions about Russell Wilson, Frank Clark, and more. 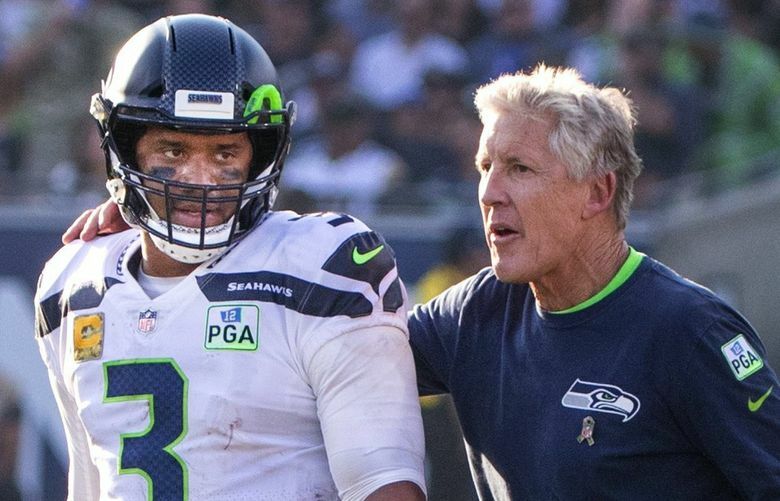 Q: Perhaps someone has already suggested this, but as a possible solution to the Russell Wilson dilemma, could (not that they would, but could) they give him a small percentage of the franchise (making him a part owner), but a percentage worth his accepting? If they were willing to do that, he would have a vested interest in not only staying, but doing really, really well. In that case, couldn’t they also pay him a salary of $12 a year (since most of the money would come from the other source) and thereby free up all the cap space and money to build an even better team? Q: Bob, I was wondering if contracts can offer things that aren’t direct compensation as a means to attract players and share the wealth of these contracts. For instance, what if the Seahawks agreed to donate 10 million a year to a charity of Russell Wilson’s or Frank Clark’s choosing? What if they added on to league mandated health care benefits for their players once they retire? A: Here’s the quick answer — no. NFL teams can’t do any of that in attempts to get around the salary cap. Trust me — if they could they would have been doing that long ago. The cap is hard and the rules are strict — any compensation given to a player would be considered salary and would have to be accounted for under the cap. And the NFL takes a hard look at all contracts — they all have to be approved by the league office. The Seahawks can surely donate to whatever charities they like, but I would imagine that doing so explicitly to keep a player around would be considered compensation, and contracts can include other incentives. But again, anything a player would get would have to be approved by the league and the league would undoubtedly consider any of it as salary and require that it go under the cap. So while those are all nice and creative ideas, they wouldn’t pass muster from the NFL. What would be the Seahawks asking price for Frank Clark ? A: Well for what it’s worth, a report from FanSided.com Tuesday said the Seahawks would want at least a second-round pick, which is what the 49ers got for Dee Ford, whose situation was similar to that of Clark’s. But my hunch is the Seahawks would want more than that for a young pass rusher in his prime — maybe a second and a third? Or a first and a mid-rounder? — especially at this stage of things. Seattle has until July 15 to work out a long-term deal with Clark, and while the Chiefs did up and trade Ford quickly, I think the Seahawks would be willing to be patient with Clark, unless they simply get to a point where they don’t think anything will work out. Remember that since Clark was tagged, he could sign with another team but that team would have to give the Seahawks two first-round picks in return. So nobody is going to give more than that (though I don’t think anyone will give close to that). Q: For the next mailbag, whatever happened to Khalid Hill? I know he came into camp last year, got injured, and then released. Sportrac shows the Seahawks have/had money going to him, so is there a chance he would be back, possibly for the fullback position. A: Hill, for those who may have forgotten, was an undrafted free agent signee from Michigan who then suffered a shoulder injury in the preseason and was waived off injured reserve in October. He has not signed with a team since. For what it’s worth, OvertheCap.com does not show any dead money going to Hill in 2019, with its breakdown of his contract indicating all money was paid out last year — $97,412. I never rule out the Seahawks bringing back any player so maybe Hill could return at some point. Seattle’s fullback spot certainly looks a little barren at the moment — they don’t have one on the roster with last year’s starter there, Tre Madden, remaining a free agent as well — and I’d assume the Seahawks will have a fullback on the roster when training camp begins. Why was the entire strength and conditioning staff replaced? A: Basically just to shake things up and bring in some new ideas and maybe see if they can find some things to eliminate some of the pesky muscle tissue injuries they’ve had over the last few seasons (here are the details on the changes the Seahawks made, including hiring former UW strength and conditioning coach Ivan Lewis to take over). A: I wouldn’t think so given not having much cap space — Seattle has about $10 million, more than only six other teams, according to OvertheCap.com — and lots of other things to try to get done contractually. That Ndamukong Suh is still available seems to speak loudly to the desire of many teams to try to maximize their potential compensatory draft picks, a group that includes the Seahawks. If Seattle does have any extra money to spend, I don’t see them doing anything significant until after May 7, when free agent signees no longer count against the comp pick formula. Also, Duane Brown said he wanted to finish his career in Seattle. How much longer is his contract? A: Brown’s contract, which he signed last summer, goes through the 2021 season — he would be 37 years old when the 2022 season begins. So he’s locked up for now. Why do we seemingly always face AFC West teams in the preseason? A: Because what the Seahawks mostly want to do in the preseason is play games that don’t require a lot of travel. So the AFC West teams work well for that since they are relatively close but also are not division opponents —- another goal is to avoid playing teams you’ll see during the regular season, though it’s not that big of a deal since teams don’t show much in the preseason anyway. Still, all things being equal, teams try to avoid that if they can. So playing the Chargers and Raiders every year makes sense in being the two closest AFC teams. Denver is also a relatively easy trip.